In a setback for progressive parking policy in San Francisco, the Board of Supervisors voted last week to eliminate the SFMTA’s ability to install any significant amount of new parking meters under a new five-year contract to upgrade existing meters. The $54 million contract originally covered 25,000 parking meters that accept credit cards and multiple forms of payment to replace existing meters, plus 10,000 for backup stock and some potential expansions, which would require a separate public planning process before installation. But supervisors appear to be going along with the anti-meter campaign led by Supervisor Mark Farrell, amending the contract to remove half of the additional 10,000 meters. SFMTA Director Ed Reiskin said that only leaves room for the agency to fill “very small-scale requests” for new meters from merchants. 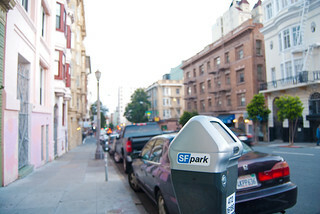 Parking meters are essential to San Francisco’s policy of prioritizing on-street parking for local merchants and residents before drive-alone commuters. As land uses diversify across the eastern neighborhoods of the city, there will continue to be a need for new metered areas to ensure that commuter parking not displace the short-term parking that supports neighborhood-serving businesses. A cap on parking meters will limit MTA’s ability to manage on-street parking for the benefit of local merchants and their customers. Even though SFMTA officials stated in no uncertain terms that the location of any significant expansion of meters could only be initiated through a publicly-vetted planning process, supervisors unanimously approved the amendment, citing a lack of confidence in the SFMTA’s outreach process. The SFMTA Board of Directors voted last week to require more stringent outreach measures for new parking meters. The lone vote against the contract from Supervisor Jane Kim apparently wasn’t intended as a stand for rational parking policy. Instead, Kim said she wanted the contract to include provisions that would bind the SFMTA to adhere to its allocation plan for the meters — an authority that the Board of Supervisors doesn’t have, according to the City Attorney. Supervisor Farrell, who has vehemently opposed charging drivers to store their cars on public streets, said he was satisfied with the contract as amended. “I don’t like paying at all, but if I have to, I’d rather pay with a credit card than through the old meters, so I think it’s a step in the right direction,” he said. Supervisors Farrell and Malia Cohen had already made their anti-meter stances well known. With this contract, supervisors who have otherwise stood out as leaders on progressive transportation policy joined them. Supervisor London Breed said she doesn’t “want to wake up one morning, and all of the sudden, two, three, four blocks in my neighborhood have meters,” a sentiment echoed by Supervisor Norman Yee. Breed also revealed her stance on the expansion of meter hours to Sundays, which was implemented at the start of the year, when she took office. “I don’t know why” that policy was adopted, she said. Reiskin said the supervisors would have to vote to modify the contract for the SFMTA to add any other meters within the next five years. “We certainly wouldn’t be able to do anything on the scale of what we had originally proposed, for example, for the northeast Mission,” he said. Supervisor Scott Wiener said “there are times when meters do make sense,” and that the upgrade to meters that accept credit cards is long overdue. Wiener also pointed out that he’s heard of a case in which the SFMTA rejected a merchant’s request for meters. “It’s a bit more of a nuanced issue than people sometimes perceive,” he said. As Radulovich noted, “limiting parking meters will mean more congestion, and more pollution” as drivers circle endlessly for a free parking spot in neighborhoods where demand exceeds supply. Good lord. Did a bunch of zombies replace the Board of Supervisors?? Shaking my head so hard. They just don’t get it. They’re all thinking of running for mayor and don’t want to be connected with the unpopular hot-button idea of charging a fair market price for street parking. This is why these types of policy decisions were removed from the supervisors direct sphere of influence by having SFMTA budgets without line by line supervisor control. Somehow they got around that very good idea and are back in there with politically motivated micro management. Certainly true. I have to wonder if they also genuinely don’t understand that parking meters create availability though. It is in fact a convenience for short-term parkers, ultimately. To be fair, SFMTA claimed they weren’t planning any major meter expansions, and the SFBOS just called their bluff and said: “We know you aren’t, but if you wanted to, come to us first”. The idea that 5,000 more merchants could have had the opportunity to request meters is not believable – it’s a tragedy of the commons thing: everyone benefits from meters together, but everyone suffers alone, so a lot of merchants just do the short-sighted thing and oppose meters. So this move only prevents large-scale expansions that wouldn’t have happened anyway without supervisors dipping their nose into the matter. The truth is, supervisors already had a lot of behind the scenes veto power regarding parking meter expansions, as evidenced by Campos’s sleazy maneuvering regarding the eastern neighborhoods’ parking plans. And since it’s behind the scenes, there is no opportunity for citizen control. My hope is that if SFMTA can draft an incontrovertible rational plan for expansion and bring it to the SFBOS in a public forum and they reject, then the heat will truly be on them. They won’t be able to play both sides the way they do now. I am sure a fair bunch of them understands this full well. This is political posturing. There are loud crazies that yell at them and they want to score political points by claiming that they have created a process that makes things more accountable. They can now claim with a straight face that SFMTA cannot go on an unchecked expansion of meters. They are really delaying the heat until such time that SFMTA actually goes to them with a plan for meter expansion, in which case they will have to go on the record with whether they are transit first, or parking first. totally agree. I’m running out of ways to explain what these people are thinking. There’s a reason why there is no parking… there are more cars than spaces! And no, building garages does not solve the issue. As you can see, our parking lots are underutilized, people’s garages are not storing cars, but are being converted into storage units if not in-law units, and if you live in a destination area (think commercial district) there will always be high demand, but YOU should not want to park on the commercial street and deny the patrons that keep your neighborhood vibrant. Because we live somewhere does not mean we are entitled to a PUBLIC parking spot. Parking meter SHOULD be used where demand exceeds supply and should be in effect when that demand exists. The SFMTA will find other ways to torture the motorists just as they are torturing Muni riders this week. We will be watching them and reporting any problems we see. We suspect the press will be only too eager to chime in as well. As the professor who wrote Street Fight has pointed out — one mode’s gain is another mode’s loss. Parking seems to be almost a third rail for politicians fearful of backlash. Rather than concentrate on the hardest battles that center on taking away subsidized car storage on public streets, I suggest we concentrate on building transit that happens to take away parking but is not centered on that as a goal. Exclusive transit lanes take away either travel or parking lanes, but at least they command a lot of support from Muni’s 700,000 trip takers per day. Wider sidewalks take street space but have again a large constituency. Bike lanes do so as well, but are as yet the most contested and have the smallest current constituency. Parking policy is a key element, but we advocates of better streetscapes have to focus public attention on other improvements and deal with parking as an ancillary issue. You and your fellow “we want all the free/cheap parking” drivers are torturing us Muni riders. Optimizing for “mode” instead of “people ” is bad policy. The false economy of trying to kick the parking can down the road prevents us from getting a much better overall result. The problem is that as we’ve seen with recent proposals — including the Oak St. bike lane and the Potrero St/SFGH upgrades — SFMTA inevitably gets backlash about repurposing even a handful of parking spaces. They then come up with alternate plans that lack key elements of the original plans, in the name of “saving” parking spaces. Also, in both of these projects, they’ve turned side streets from parallel to perpendicular parking to offset the number of parking spaces being reclaimed on the main street. We have to have this fight. We have to continue making the case that parking is a choice, that there are alternative uses for public street space, and we have to keep working to put more of those alternative uses in place. Shamelessly, Do you think we are winning or losing this fight over overt parking spot repurposing? I ask, because I wonder if we ourselves are listening too much to the noisy parking preservationists instead of pouring most of our efforts into getting massive amounts of transit, ped, and bike infrastructure built + serviced where resistance from parking place preservers is less organized. I agree that ultimately the parking elimination fight must be fought. Just wondering about when. It’s a fair question. I was actually going to end my previous post with the observation that the strongest case for removing parking will come when MUNI can actually serve as a viable alternative for getting between any two spots in the city–meaning it’s predictable and runs often. I guess I feel like we need to work on both tracks at once, as we have been doing. Groups like ENUF, that don’t allow for proper parking management, are hurting Muni’s ability to run predictably and often. Willie Brown calling for more parking garages will only make city streets worse for Muni. I agree we can’t go all stick and no carrot, but the carrot won’t happen without some actual stick. If there is any city in the United States other than the Borough of Manhattan which is suited for a commuter tolling curtain, San Francisco is it. You have five access paths of any size: the Bay Bridge, the Golden Gate Bridge, US 101, I-280 and SR82. You can’t toll I-280 or the Bay Bridge (I-80), but you can toll the other three at the city limits and you can toll the southbound exits to surface streets from I-80 and the northbound ones from on both north of their interchange. Tolling only the exits would allow traffic which needs to pass through San Francisco between the Peninsula and East Bay to avoid the curtain. Well yes, that requires the caveat that northbound vehicles originating north of San Bruno would have to pay or double back via I-280. With a paywall you can discourage commuting from outside the city while leaving the city’s residents unharmed except when they return from outside the paywall. Folks commuting from the I-280 catchment within San Francisco are very well served by the Muni Metro J, K and M lines. If they insist on using I-280 to get downtown, they’d have to pay the exit toll. “Self-entitled freeloaders” rolls off the tongue much better than “we want all the free/cheap parking drivers”. Add to that, free of gang bangers and mobile human excrement dispensers that currently pollute the atmosphere on Muni vehicles. Are you referring to transit folks who feel entitled to the highly-subsidized Muni system? Fastrak parking would be better than metered parking. well of course the Stupidvisors did this! They are up for re-eleciton, they know they are going to get re-elected, so they really don’t care. They make all kinds of speeches that get the voters all gooey inside, and then get in office and it’s all about themselves. A corrupt political system combined with an electorate that’s so stupid they have to vote the way a piece of paper from a local corrupt political party tells them to, or doesn’t bother to vote at all because they’re too busy bit-diddling some new way to sell crap ensures these little political turds will float on up the term-limit ladder and continue to plunder the city for their personal gain. Next time you get asked to sign someone’s petition to run for office, don’t bother. cars are heavily subsidized too, moron. or trolls like you who pollute with their cars and their gaseous windbag BS on blogs. Who’s paying for ENUF anyways? Do you mean the Muni system which generates a large amount of its operating budget from rider fares? The rest of us – including car owners who pay their share for parking – who pay our share are the ones subsidizing “free” parking. If we’re going to stop subsidizing transportation though, it would make sense to start with elements that don’t do anything to offset their cost like unmetered parking. Those subsidized parking spaces could be put to better and more profitable uses. Privately funded public parklets are one example, but parking could also be rented for markets, pop-up stores. Even just removing the asphalt to expand the sidewalks would eliminate the cost to tax-payers subsidizing road maintenance for unmetered parking because sidewalks in front of homes and businesses are the responsibility of the owner and not the tax-payers. I don’t understand why so-called progressives are so in love with parking meters. Why do you insist on framing parking meters as either/or, us vs them. There are many, many ways to charge for parking. Individual 4-foot tall chunks of steel that are manually installed and manually collected by highly paid city workers driving carbon-emitting vehicles all over town every day is FAR from the top 5 best ways to charge for parking (even IF they accept credit cards). PLUS, and most importantly, parking meters are ugly. They are dehumanizing and an affront to our urban landscape. Why does SFMTA insist on this particular contract? Why does it not investigate what other cities are doing in terms of creative parking management and payment? Whatever your position on meters, I like my democracy with transparency. That means accountability. No blank check for SFMTA. And how do you feel about the private automobile which is 100x larger and more polluting that a steel pole. Sounds like you don’t have children. I’m pretty sure you also don’t have a magic wand. The private automobile is not going away: that is just the reality. EVs, on the other hand, will become ever more prevalent over the next decade. Biofuels may also see a breakthrough. So far political and social will is in favor of EVs and cleaner fuels. That is something we can choose and fight for. (Some individuals may also have the luxury of being able to give up their private car, but let’s not assume everyone can.) Parking meters are also something we can choose – or reject. Anyway, my post was not about parking meters vs cars, which you imply (false dichotomy). My post was about parking meters vs different way to charge for parking. Think about it before your knee jerks. Car free households make up over 30% of the city and owning and operating a car costs thousands of dollars a year. Many people never have the luxury of owning a car in the first place before having the “luxury” of giving it up. You make a lot of assumptions for someone who asks us not to assume. Exactly, you find parking meters ugly but the used car lots on our city streets seems to pass you by. That blows my mind. Ah yes, not having a private car is a “luxury”. My neighbors in the Tenderloin who walk their kids to school are really living the high life while the poor people in the Marina and Noe Valley are slumming it with the private cars they have to drive around. Maybe after your next promotion you will also be able to afford to sell your car, move your family to a studio and take muni! It’s nice to day dream after all. I’m so tired of hearing from people who claim they absolutely must have a car because of the children. I don’t have kids myself, but I know enough car-free parents to know that the ‘need’ to own a multi-ton vehicle to ferry around your kids is completely fabricated. And when it doesn’t stop at every damn block. The idea of having a buses that are almost as slow as walking baffles me. I think it’s funny that you demonstrate an extreme version of everything you just critiqued. slightly longer answer, streetsblog is about re-imagining our streets as places that better serve the public. One of the worst ways of serving the public with limited public street space is the free storage of private automobiles. This is especially true in commercial areas where business have customers arriving by car. I’m not that into parking meters myself because I’m not that into parking in general, but I definitely feel that if people want to store their private property on the streets, the least they can do is pay for it. When I drive I understand that I’m responsible for parking at my destination and plan accordingly, and that includes locating and paying for parking. Also it’s rude to interject into a discourse demanding to be educated on a topic when you can easily educate yourself for free, even by just exploring similar topics on streetsblog. The fact that you can’t imagine it doesn’t make it a luxury. In fact, the fact that you can’t imagine it is a good indication that it’s the opposite of a luxury. As to people “attacking” you: you said something that was false and disingenuous, so people chose to respond to it. That it wasn’t your main point it irrelevant. It was one of your points. Biofuels may also see a breakthrough. So in addition to preferring parking to other uses like housing or parks, you prefer fuel security to food security. Wonder how much these self-entitled freeloaders are spending to prevent spending their share for parking.